A few months ago there were reports of a world wide shortage of kale. Can you believe it? Who would have thought that this humble leafy green would become so popular all of a sudden? The dutch have been eating the stuff for ages. I remember having it as a small child in Holland with mashed potato and sausage. Don’t think I liked it much – then again what four year old would? Now in many cities around the world people are sipping kale smoothies and crunching kale chips like they are going out of fashion. We have been devouring it at such a great rate that this year the worlds largest kale seed providers in the Netherlands reported it had run out of every type of kale. Fear not kale lovers, apparently since then the company has upped its production and used seed reserves to help its growers maintain their crops. Kale along with his friends quinoa, wheat grass, soy, acai and pomegranate are no ordinary foods, they are “superfoods” packed with special health benefits. Not only can they lower your cholesterol and reduce your risk of heart disease and cancer, they can even put you in a better mood or aid weight loss. If we eat them in large enough quantities we will live forever! Since when did foods have to become “super” for us to eat them anyway? It’s just food!! The only things that are “super” are heroes and models, oh and of course, my husband (Rod insisted I add that in). 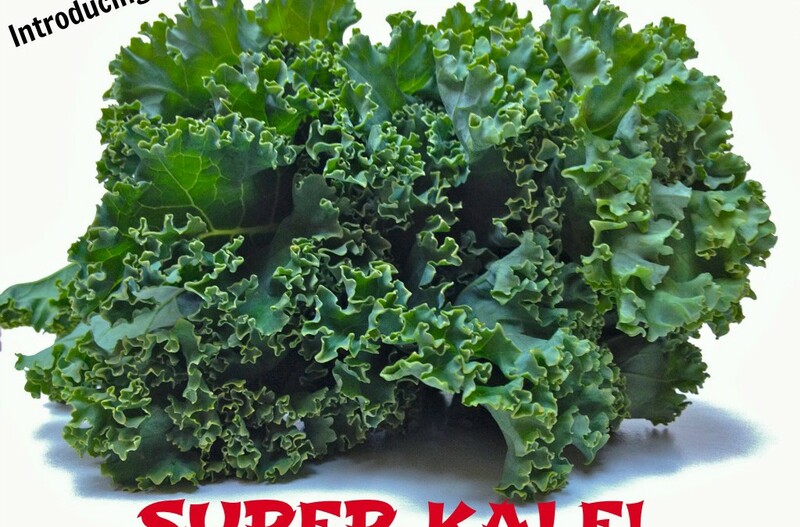 Kale is one of the recent additions to the superfood list. Apparently Gwynth Partrow swears by it. It’s high in fibre to keep you feeling full, higher in iron than beef which is good for vegetarians, high in vitamin K for bone health and vitamin A for healthy eyes and skin. Plus due to its large number of anti-oxidants it helps protect against cancer. Whats more it can also help lower your cholesterol. Kale can be easily grown at home as it tolerates less then perfect soil and weather conditions and becomes sweeter with frost (good news for us Southern Highlands residents). However, like everything, kale can be over-dosed. Kale is definitely good for you but we need to avoid an “all kale all the time, every meal, taking over our plate” attitude. Otherwise, we risk turing it into a bad thing. Excess consumption of kale could interfere with our bodies ability to get enough iodine which in turn can cause hypothyroidism, also referred to as an underactive thyroid. However, one would have to eat A LOT of kale for this to happen. In usual amounts, kale consumption is healthy even for someone who has a pre-existing thyroid problem. Kale is great if you like it, but there are plenty of other alternatives that will give you the same health benefits such as spinach, broccoli and watercress. Giving so much attention to one food overlooks these other heroes that might be similarly “super”. The trouble is, no one knows what a superfood is. It is not a scientifically or technically defined term. It’s not a word that health professionals or researchers really use. The reality is the term superfood is a buzzword best used for marketing purposes rather then describing the actual nutrient vale of a specific food. There is no good evidence that any of the things we call superfoods are actually better for us than the normal fruit and vegetables we should be eating as part of an everyday nutritionally dense diet. I am not saying that there is no scientific research into superfoods. It’s there, but much of the evidence comes from cell cultures or animal models. Just because a chemical component of a superfood can kill a cancer cell in a petri dish in a laboratory doesn’t mean that eating lots of a food containing this chemical will prevent you from getting cancer. Even when these studies are done on humans, they’re often tested in very high concentrations over short periods of time which is not reflective of a broad, nutrient dense diet. There’s nothing wrong with many superfoods, whats wrong is the claim of their “superpower” status. What concerns me the most about the term superfood is that it suggests a quick fix magic way of getting the nutrients you need at the expense of general all-round health. People shouldn’t use superfoods as a tool to somehow balance out other unhealthy habits. “Hey, its ok, I can have some KFC, a coke and a cookie because I had my wheatgrass shot for breakfast .” It doesn’t work that way. A fixation on superfoods can distract people from the benefits of healthy everyday foods and lifestyle choices. What most of our diets are laking is not any one super source of nutrients, but rather a simple focus on maximising nutrients. This is best achieved with a wide variety of nutrient dense foods. Everyday fruits, vegetables and other whole foods each have their own nutrients and contain individual properties that can be said to promote health and wellbeing. No single food item, or even group of superfoods combined have enough superpowers to replace a varied and healthy diet. There is good evidence that a nutrient dense diet with plenty of fruit and vegetables and a moderate amount of exercise will help you live a longer and happier life. So if you despise kale don’t stress, have some broccoli instead or go swing a kettle bell. You could also try some kale chips (recipe below)….. if I had these as a kid I probably would have liked kale a whole lot more! Preheat an oven to 175 degrees C. Line a baking tray with baking paper. Wash kale and dry thoroughly. Using a knife or kitchen shears carefully remove the leaves from the thick stems and tear into bite size pieces. Drizzle kale with olive oil, rub in gently using your hands and sprinkle with a mineral salt (not table salt). Lay kale out onto a baking tray. Bake in the oven until edges are just brown but not burnt, about 10 – 15 minutes.